Eaglebrook School, a junior boarding school for boys in Deerfield, Massachusetts, has a rich history dating back to 1922. So when it was time to build new faculty housing, they wanted to ensure that the dwellings would not only adhere to how the school and faculty interact, but also fit in with the existing structures on campus. The result is a faculty village with sustainability features and open plans inside and outside. 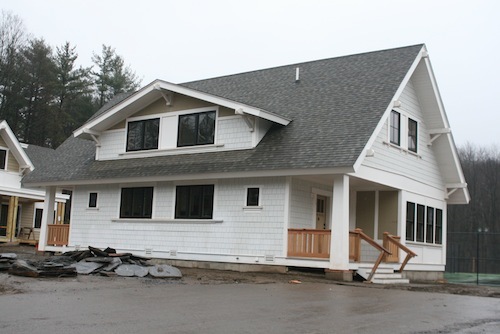 Keiser Homes in Oxford, Maine, worked with Windigo Architecture LLC to design and build four structures for Eaglebrook School faculty – two single family and two two-family homes to create six total units of new housing. 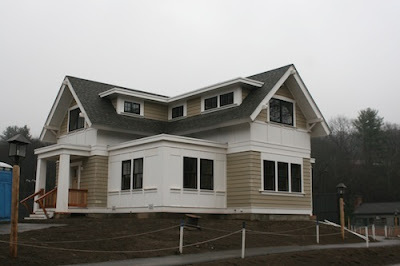 The houses have a craftsman style feel, taking a nod from the aesthetics of the oldest buildings on campus. 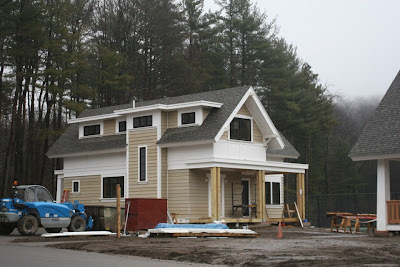 In addition, many energy-efficient features were built in, including spray foam insulation, a roof with a R-60 insulation value, LED lighting and a geothermal heat pumping system to provide efficient heating and cooling for the homes. Open floor plans, decks and porches allow for faculty and students to gather, as they often do during the school year. 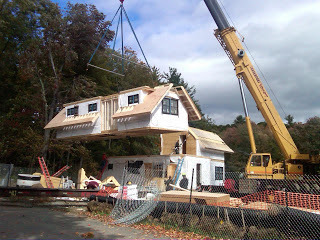 By using a modular construction, the amount of work on campus was greatly decreased. It is fantastic that architects can control their compulsion to draw lego boxes and create such warm humane buildings. It is even very easy to locate the door on these things, and the roofs! My Lord! The roofs are designed to shelter the buildings and shed, you know, water. Amazing.